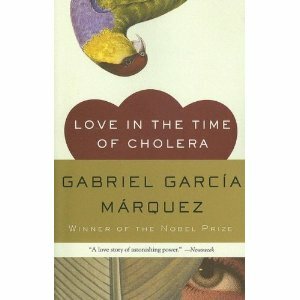 Love in the Time of Cholera is not an engrossing love story as some will tell you; it is nothing more than a brilliant essay on the illusions of love. Set in the late 1800’s, Florentino Ariza falls in love with Fermina Daza, they have a three year long affair in letters and then she ends it with one short phrase: “What is between us is nothing more than an illusion,” and then marries another. Fifty one years, nine months, and four days later, her husband Dr. Juvenal Urbino dies and her teenage flame Ariza presents himself again at the funeral. Despite all his many sexual affairs throughout his life he has supposedly saved his heart all these years for Fermina Daza alone. Much like Flaubert’s Madame Bovary, Florentino Ariza is in love with soap operas and romance novels, so much so all his letters to Daza when they are young read just like one. He is so involved with the idea of romance after Fermina’s rejection of him he makes a pass time writing love letters for other couples. Ariza is all youthful passion and intensity saying, “Age has no reality except in the physical world. The essence of a human being is resistant to the passage of time. Our inner lives are eternal, which is to say that our spirits remain as youthful and vigorous as when we were in full bloom. Think of love as a state of grace, not the means to anything, but the alpha and omega. An end in itself.” Needless to say, he’s all swoon and flowery words as he makes his way into the bed of over six hundred women in the course of his life while pretending to be faithful to only Fermina. None of the women know about the others and each is told that she is his first and only, perpetuating Ariza’s illusion of himself that he is a heart sick and loyal love puppy in need of nurturing. In the mean time, Fermina Daza has married a very clinical man, its no mistake that Garcia has written this character to be a doctor by profession, who is overly concerned with appearances. Dr. Juvenal Urbino loves classic literature, does not listen to “popular” music like Ariza, but music he imagines gives him the right to look condescendingly on other’s tastes. Fermina takes part in this illusion of high society that her husband has chosen, most likely having married him for it in the first place as they have very little in common. She prefers all the opposite things, helping the reader understand why she was captivated by Ariza in the first place – he wrote to her beautiful letters, like the love stories she was enraptured by. Ariza learned to play the violin when they were young and played her beautiful music, “popular” quixotic pieces from the street. However, I also believe that the idea that the Urbino’s fifty one year long marriage not having a true element of love to it is also not unfounded. Their relationship was based purely on an act of will, as if willing themselves to love would be enough, as though creating an illusion of a happy marriage would trick not just the world but themselves that their marriage was a happy one. It becomes all too obvious that their relationship could not stand on its own two feet when after his death Fermina’s idea of his character is blown totally out of the water and she believes him to have had an affair with their family friend just because someone insinuates it. A woman with a true and solid relationship based in honest love could not go fifty one years and still not know if her husband ever loved her. Dr. Joyce Brothers says, “The best proof of love is trust.” Clearly, neither of them really loved the other. Love is a choice, but it is also a passionate driving force. This book makes it quite obvious that two people must have more than just passion and more than an act of will, there must be balance. In 1 Corinthians chapter 13, it states, “Love is patient, love is kind, love does not envy. It does not boast and it is not proud; it’s not rude or self seeking. Love is not easily angered and it keeps no record of wrong, it does not delight in evil but rejoices in the truth. It always protects, always trusts, always hopes, and always perseveres. Love never fails.” Needless to say, sometimes it takes a lot of work and a lot of persistence to love someone and in this both Urbino and Ariza had it half right. But there is also something to be said for the poetry of love, and in this Ariza went so far it seemed insincere, and Urbino neglected it altogether. When it came to having the whole package, all three of these characters seemed to have gotten it so wrong, treating love like the plague that swept through the nation: either something of great force that snuck up on them, or an ailment that they’d have to spend a long time living with.